Hailing from Oxford, U.K, listeners can be forgiven for thinking this incredible nine piece band are more likely to be from Oxford, Mississippi, such is the authenticity the band brings to their take on rootsy American folk, hillbilly, alt. country, etc. Alright Oxford, Mississippi is not the first place that comes to mind when thinking about ‘hillbilly’ music but you have to admit it is a lot closer than the area surrounding a town or city in Oxfordshire U.K! 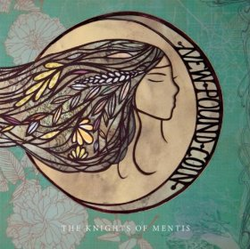 How they got their name is open to conjecture and knowing that mentis translates as ‘mind’ is no real help but the album’s title could not really be more British, something which could give a casual observer a completely false impression of what this band and their truly great album are about. As we have suspected with a number of other British bands, this tremendous nine piece prove beyond all reasonable doubt that you don’t have to be born in the U.S to really have a feel and a talent for the edgier side of country music. The band consists of Peter Graham on guitar and vocals, Jed Dale plays dobro, weissenborn and vocals, Keith Birnie banjo and vocals, Francis Leneghan is on mandolin, Jeremy Bourgein, keyboards and accordion, Malachy O’Neill on double bass, Matt Walsh, drums, Sally Baden plays Fiddle and Simon Baker, harmonica. It almost beggars belief that a band containing nine multi instrumentalists can produce an album of not only extraordinary quality but also one on which the instrumentation is never over done. Whoever arranged these songs has done an absolutely superb job, at times giving many of them a sparse feel, despite the numbers. The songs were all written by Peter Graham and Jed Dale except for Red Diesel on which Keith Birnie shares a co write. Peter Graham has a vocal quality similar to Willy Taylor of The Good Luck Thrift Store Outfit, a band and a vocalist that I thought to be almost without peer in the modern day. In fact, this band is up there with that esteemed group in just about every way, such is the enormous quality they possess. The sheer musicality ensures that the listener can easily visualize many of the songs stories, really feel the depth of the atmosphere that is created and long to see them perform in a live setting! I must admit that for me Peter Grahams vocals are the icing on this extraordinary cake thanks to the incredible emotional depth he brings to the songs, but that is not to put down the other lead vocalist Jed Dale. On the contrary, having two vocalists of such quality, is something all but a very few of the greatest bands of the last few decades would have killed to possess and when you add these together and bring in Keith Birnie the harmonies are of the same quality. In mentioning some of the songs it is well worth noting that the eleven songs are all of the same tremendous quality with great lyrics and memorable melodies and as is occasionally the case I had to pick the songs completely at random! Red Boards has a real front porch hoedown tempo with a density to the instrumentation that includes harmonica, fiddle, banjo, drums, dobro, acoustic guitar, bass and occasional piano on an intensely atmospheric ‘hillbilly’ song. Peter Grahams lead vocal and the terrific harmonies drive the song hard, but that dense instrumentation which presumably includes every band member always has a disciplined feel that is never messy, instead giving an epic feel to the song. Jonny is a quite stunning ballad that is highlighted by the lead and harmony vocals on a tale that has a slow, moody but strangely cinematic quality. Maria is an atmospheric reinterpretation and extension of the classic Jack ‘o’ Diamonds, with almost spooky fiddle, banjo and tremendous harmony vocals and the mournful cello and occasional mandolin eventually joined by a haunting harmonica. It really is a gorgeous song and those harmonies at times are really an evocation of the atmosphere ‘The Band’ used to create in their heyday, although this bands harmonies are tighter! Red Diesel is a song that is mainly instrumental and is easy to envisage in a live setting with fiery mandolin, banjo, fiddle, guitar, harmonica and drum propelling the tune, then just before the two minute mark a tremendous three part band harmony joins in! Last but far from least to be mentioned is The Other Side with its haunting, lonely guitar intro with touches of chiming mandolin to accompany the high lonesome vocal and harmonies on a song played at an appropriately funereal pace and with a lovely moody sparseness. Eventually the mournful violin joins in to give the song the powerful feel of an old American civil war story on this gorgeous tale and performance. I really want to write about every song on this brilliant recording but mustn’t rob you, dear reader, of the treats that await you when you put your copy of the album in your c.d player and push the play button! In reflecting on the quality of this album it becomes obvious that if this is an example of the standard of Britain’s take on ‘country music’ we no longer have any need to mention how well we are doing this side of the Atlantic, equality has been gained! This applies not only in the writing, playing and singing but more importantly in the feeling of authenticity! This is an idea, at least for me, that has been gaining ground with bands such as Society, Redlands Palomino Company, Curst Sons, Rattleshack and in varying degrees a number of other artists. Perhaps ‘our’ musicians missed out on being born in the U.S but their roots are in the same music as our American brethren and after all, modern musicians have for a long time had access to the same music and consequently many of the same influences either side of the ocean. I really look forward to hearing a better album than this tremendous recording this year, but know that is extremely unlikely to happen! where you can download it for a measly £7!